Although this is the back of the house, it faces the main highway, so it's the logical place for a sign. This stunning Victorian mansion was built in 1895 as a wedding gift to Charles C. Parker and his bride, Mary A. Wolf. (Beats 14 toasters and a re-gifted set of steak knives, doesn't it?) The house features a tower, ornate woodwork, and several leaded glass windows, including curved glass in the tower. Leaded glass is also used in the dormers that adorn the roof line. It was Mr. and Mrs. Parker's home until Mr. Parker's death in 1921. Due to financial difficulties, the house and all its contents were sold at auction in 1926. 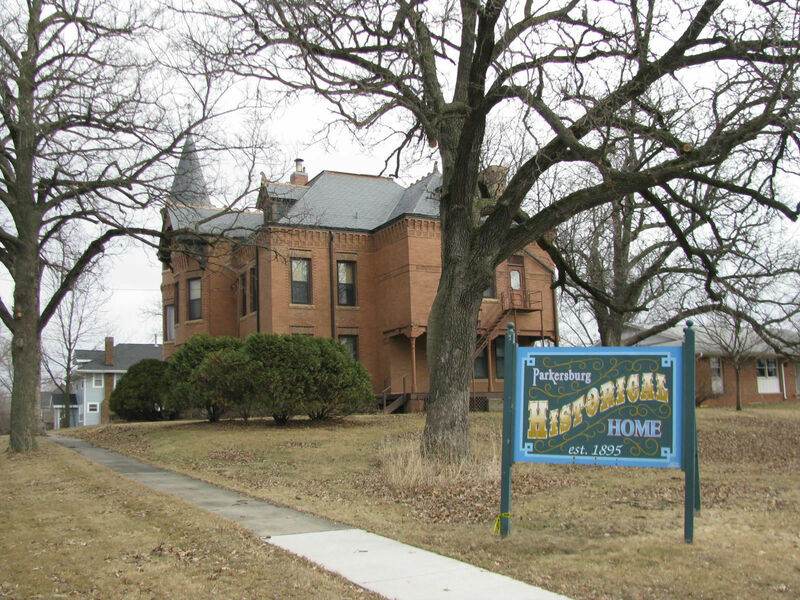 Saved from demolition by the Parkersburg Historical Society, the house today serves as a museum and headquarters for the society. According to the museum's website, the house is open for tours on Sundays during the summer. Visit the museum website for photos of the house in its early days, the elegant interior and samples of the museum's collection of artifacts. Parkersburg Historical Home - Museum page of the Parkersburg website, including a photo tour of the inside of the mansion.